Compiler design is a complex endeavor, but also one of the most satisfying projects you can undertake. Lately I’ve been interested in compiler and parser design; my interest piqued by Debasish Ghosh’s wonderful book, DSLs in Action. Web development in general provides a far less opportunity to work in the domain of compiler or interpreter design. So the idea of building DSL’s was the perfect excuse for learning parser design. To design a good DSL it is necessary to have some compiler design knowledge under your belt. The classic Dragon book is usually the first choice of reference to pickup on compiler design, but it is too theory oriented, and what I needed was something to get me started with writing code quickly, rather than mull over automata theory, syntax trees and other compiler theory concepts. My first choice was Ronald Maks Writing Compilers and Interpreters. Although it is an incredible book, it is rather elaborate in its presentation. What I instead wanted was a cookbook style presentation, using which I could quickly design some working code, and only later refer to the above books for more in-depth understanding. 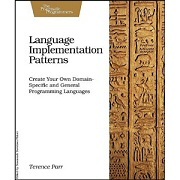 After looking around for a while I settled for Terence Parr’s Language Implementation Patterns. This is exactly what I needed – bit sized patterns on compiler and parser design with working code. The book provides a recipe style approach, gradually moving from simple to complex compiler/parser design issues. As I primarily work with PHP, I thought of porting some code to PHP to see how it works. Below are some of the few recipes from the initial chapter of the book, on designing a LL(1) lexer and parser. The language we want to recognize is an extremely simple one – a list of names like [a,b,c,d,e]. A LL(1) lexer for the same is shown below. Testing the lexer from the command line is given below with the language string passed as a argument. The lexer just outputs the tokens of the language, throwing an exception if a character outside the language is encountered. A parser for our simple language is given below along with the test script. This uses the Token and Lexer classes we defined earlier. The parser takes our input language as a argument from the command-line. Passing a correct string to the parser will return nothing, as we have not implemented any language processing code. Passing an incorrect string will throw an exception. throw new Exception("Expecting name or list : Found "  . public $input;     // from where do we get tokens? throw new Exception("Expecting token " . After working through the code, you may realize that PHP is not a very good candidate for developing programs of such kind. Even though you can accomplish the task in hand, developing a much more complex parser design in PHP can be a challenging task. If you want to play with the code, you can download it from below. I wasn’t going to leave a message, until I realized that your CAPTCHA is displayed as plain text and asks the user to solve an arithmetic problem. You could write an arithmetic lexer and parser to analyze the natural language and return the answer to the problem. Natural words could be handled as inline comments, whereas numbers and operators are treated as they should be; thus rendering it an ineffective CAPTCHA. I thought that was pretty ironic. Thanks for the article. I had been toying around with the idea of writing a DSL for a project. But every time I started down that path, I backed away due to scope creep. Hopefully I can get around to it during spare time. The article reflects very well 50 % of the reasons or origins of the failures of a project software. But other one is absent 50 % about which one never speaks: the economy. Without an economic previous serious study on having begun a project it has 50 % of probabilities of which it fails independently of the arguments exposed in his article. Very goog article, A PHP parser is slightly slower but is a real time saver for the building.